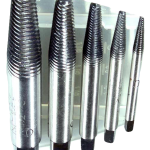 Consider a full tap & die set. These taps have a reversed twist so undoing the snapped shaft drives them deeper into the pilot hole you drill to get them started. Some sets come with the drill bits for the pilot hole.